Taglines: Everyone Runs. Everyone Hides. 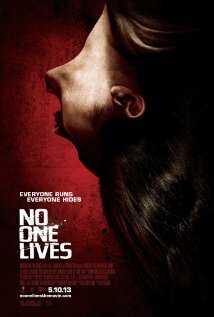 No One Lives is the type of movie that starts as many others and suddenly becomes something unexpected. It is difficult to tell what happens without spoiling; but as in others Ryûhei Kitamura movies, there is no Good vs Evil but Evil vs Evil. If you never see any of his movies; get VERSUS before looking at this one. Performances varies; Luke Evans is perfect; totally charismatic and captivating. Derek Magyar is terrifying as a psycho meeting his match. Laura Ramsey is pretty good as the other female characters; but Adelaide Clemens disappoints in a complex character far above her acting skills. There is strong violence and gore but it never gets too disgusting (or at least too realistic) and are lots of dark funny moments.